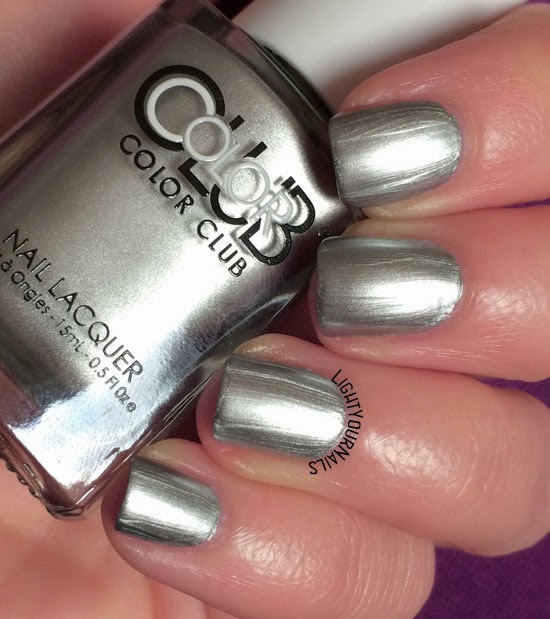 Color Club On The Rocks | Light Your Nails! Questa settimana sarà interamente dedicata a un brand che ho sempre amato: Color Club. Cominciamo con lo smalto Color Club On The Rocks*, color argento e finish metallico. Ovviamente finish metallico significa striature, impossibili da evitare anche facendo la massima attenzione con la stesura. Si può ovviare al problema facendo un’ultima passata con una spugnetta e sigillando subito con un top coat, ma io sono troppo pigra. Striature a parte, la stesura è semplice e lo smalto è molto luminoso. This week is all about a brand I’ve always liked: Color Club. 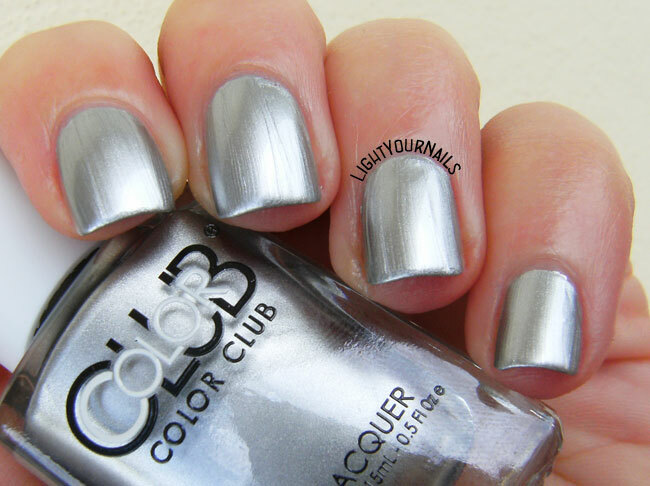 Let’s start from Color Club On The Rocks*, a silver coloured nail polish with a metallic finish. That means brustrokes, it doesn’t matter how good you paint it, you just can’t avoid them. The only trick is to sponge a last layer of colour and top coat immediately after. I’m too lazy for that though. Other that noticeable brustrokes application is easy and the surfase is very bright. Sarò sincera, non sono un’amante del finish metallico, ma ne possiedo parecchi perchè di solito funzionano perfettamente per stampare. Ovviamente ho subito messo alla prova Color Club On The Rocks in questo senso e sì, funziona! Voi cosa ne pensate delle unghie argento e di questo finish? To be honest I’m no big fan of metallic nail polish but I own quite a few because they usually work perfectly for stamping. I’ve immediately checked if Color Club On The Rocks stamps as well and I’m happy to report that yes, it does! 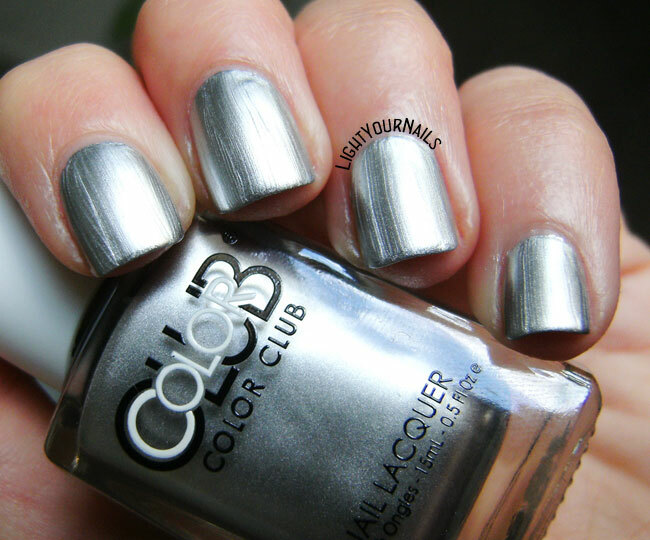 What do you think of silver nails? And what about metallic finish? Também não uso muito, mas achei que ficou bbem bonito sim. Io sono un'altra che non ama poi così tanto il finish metallico, ma ha smalti metallici (identici in alcuni casi) ovunque, votati al nobile finish dello stamping e... Vabbé in pratica ci potrei stampare tutte le pareti di casa ed avanzarne ancora. Però un classicissimo argento, ogni tanto, ci sta proprio! I can imagine this one in stamping action! You asked me where I bought the Cooi stamping plate. On American e-bay. Think it's too stripey for my personal taste, but that siver though, like it! Must stamp well! You don't need stamping polish with your freehand skills, that's why! Really? That's cool! I love the Essie's chromes above all. I have a love/hate relationship with metallics. I like the the thought of them, but hate the brushstrokes. This is really nice on you! Thank you! I don't really like them even when they are completely smooth to be honest! I would use this for stamping as well. I love the color, I just wish that metallics didn't have the streaks! This would be gorgeous under some jelly stamps! I also love using metallic polishes for stamping! I'm super lazy to sponge, too.